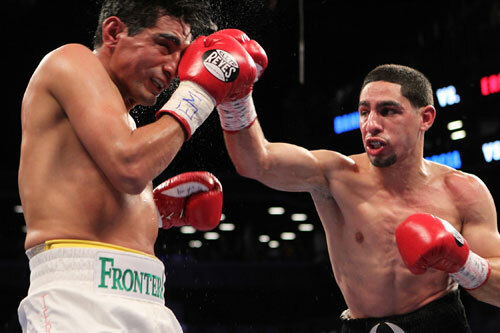 Junior welterweight world champion Danny Garcia has been named the "2012 Philly Fighter of the Year" by PhillyBoxingHistory.com. In 2012, Garcia became a world champion and defended his crown twice during the year, beating Amir Khan and Eric Morales. This is the second consecutive year that Garcia has won the honor, which will earn him his second "Briscoe Award", October 13, 2013. "It feels great," Garcia said about winning another Briscoe Award for Fighter of the Year. "It's not an easy thing to do." Garcia becomes the first fighter to win the award in two consecutive years. Steve Cunningham is also a two-time winner, but not consecutively (2007 & 2010). The Briscoe Awards are given out every year at a free public event designed to acknowledge the best of the Philly fight scene. The award is named after Bennie Briscoe, a legendary Philly middleweight who fought professionally between 1962 and 1982. Additional award winners were also announced. 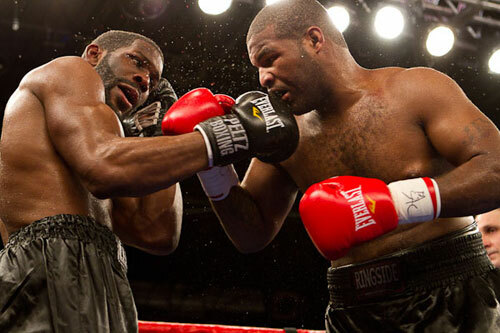 The "2012 Philly Fight of the Year" was the 10-round Pennsylvania State heavyweight title fight between Bryant Jennings and Maurice Byarm (both of Philadelphia). Jennings won the bout, but both fighters will take home the Briscoe Award for their memorable fight. Jennings-Byarm was a high level contest between two unbeaten heavyweights. It was a thrilling, quality battle that carried plenty of significance with it. Besides being a fight for the for the PA State title that put two rising careers in the balance, the bout was also the first main event for the fledgling NBC Sports Network live boxing series, which has gone on to be one of the most popular boxing shows on TV. Add to this the fact that Jennings-Byarm was a late replacement for another cancelled fight, forcing both fighters, the promoter, the matchmaker, and the network all to step up and take a major risk on short notice. Everything worked out, and the young boxers put on the Fight of the Year. The Briscoe Award is a statue / trophy in the likeness of the late, great Bennie Briscoe. Garcia, Jennings and Byarm will all receive one on October 13th. This year a new award will also be given out as well. The "Briscoe Medal", carries the likeness of Briscoe on its front side, and depicts the Liberty Bell on the reverse. The award for the best KO of the year goes to Garrett Wilson for his 12th round knockout of Andres Taylor. It was a brutal and unforgettable KO with the USBA & NABF titles on the line. Crushing KOs seem to be Wilson's specialty. "The Ultimate Warrior" also scored the KO of the Year award last year for his last minute knockout of Chuck Mussachio. Steve Cunningham gets this award for that brilliant "loss" in a heavyweight rematch against tough Tomasz Adamek. Cunningham did everything in this fight except get the decision. Add to this, that it was a fight many thought he couldn't win (especially at just his 2nd fight as a heavyweight). But Cunningham proved everyone wrong. It was a near-perfect performance, maybe the best of his career, regardless of what the judges said. Bryant Jennings did so well in 2012 that he almost out grew this category. He started 2012 as a 10-0 newbie, but after five major wins during the year, he was at the #3 spot in the IBF heavyweight ratings. NO fighter had more career movement than "BY BY" in 2012. In fact, I can't think of any fighter in recent years who even came close. For his five wins, his sprint up the ranks, and his excellent chances to one day win the heavyweight crown, Bryant Jennings takes the award. He is the first double winner for the same year in Briscoe history. This award is intended to recognize the accomplishment and potential of a first-year professional. Amateur star Jesse "Hard Work" Hart turned pro in June of 2012 and reeled off five straight wins, four by KO. He won all his fights with ease, and showed that he has the talent, size, and personality to become a major star in the sport. Clearly he is one to watch. Rasheen Brown, the young West Philly southpaw from the Shuler Memorial Boxing Gym, won his second straight National Silver Gloves Championship in 2012. He was just 14 years old at the time. Brown has been winning titles for years, and given his age, still has quite a few more coming his way in the amateur ranks. He is a prodigy in the ring, and now adds the Briscoe Medal to his already crowded trophy case. The awards will be given out on Sunday, October 13th, 2:00 PM, at a free event open to the public, at 2733 E. Clearfield Street in Philadelphia, PA. The awards ceremony will be accompanied by a Boxing Art Exhibit featuring numerous original works of art focused on the past and present Philadelphia boxing scene. Included will be paintings and drawings of Gypsy Joe Harris, Jeff Chandler, Benine Briscoe, Tommy Loughran, Wesley Mouzon, Danny Garcia, Bryant Jennings, Gabriel Rosado, Hank Lundy, Lew Tendler, Steve Cunningham, Tyrone Everett, Larry Holmes, Joey Giardello, and many more. Everyone is welcome to attend. For more information contact John DiSanto, of PhillyBoxingHistory.com, 609-377-6413.